Stormy Friday is the founder and President of The Friday Group, an international consulting firm formed to provide facilities management (FM) consulting services to commercial business and government. Ms. Friday consults, trains and speaks in the fields of organization development, marketing and customer service; and is internationally recognized in the field of facility management. She has lectured at local and international FM conferences in over thirty countries. She co-authored a book entitled Quality Facility Management: A Marketing and Customer Service Approach, (Wiley) and authored Organization Development for Facility Managers: Tracing the DNA of FM Organizations (AMACOM and Dog Ear Publishing). From 1994-1996 Ms. Friday served on the IFMA Board of Directors as the Director of Affiliate Affairs. In 1997, Ms. Friday served on the faculty of the University of Manitoba in the graduate Facility Management Program. 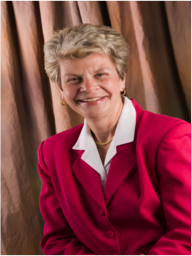 She is the recipient of the 2002 IFMA Distinguished Author – Instruction Materials Award for work with the Michigan State University Masters FM Program through their virtual university. Ms. Friday served on the BOMI Board of Trustees for ten years where she was charir of the Academia Committee. Ms. Friday also served as a seminar leader for the joint BOMI, Trade Press Master Facility Executive Series, a web seminar program. From 2006-2007 she wrote a weekly blog on FM issues for FacilitiesNet. Prior to forming The Friday Group, Ms. Friday was Director of Contracts and Government Marketing for a design/build firm specializing in high-tech facilities. She served for three years in the appointed position of Director of Facilities and Support Services at the U.S. Environmental Protection Agency (EPA) with responsibility for over four million square feet of laboratory and office real estate. During her tenure, Ms. Friday developed the first civilian agency master plan and played a leadership role in developing and implementing one of the first client services programs within the federal government. Ms. Friday also spent many years as a management consultant specializing in employment programs, strategic planning, organization development and social programming. Ms. Friday holds an undergraduate degree from Simmons College and an MPA from Northeastern University. Inducted as International Facilities Management Association (IFMA) Fellow in 1999. Authored Organization Development for Facility Managers: Tracing the DNA of FM Organizations, 2002; reprinted in 2012. Co-authored Quality Facility Management: A Marketing and Customer Service Approach in 1994. Served on faculty at University of Manitoba, Facility Management Program, 1997. Designed, developed and taught first Internet course on FM Organization Development for Michigan State University Masters Level Certificate Program in FM through MSU Virtual University. Appeared on Steelcase/IFMA television programs on quality, marketing and customer service in FM. Developed first introductory course in FM for Native Americans. Hon. FMA awarded by BOMI in 2013 for contributions to FM industry. Click below to watch a video of Stormy Friday's appearance on 21st Century Business with Alexander Haig. Applied Management Engineering, Inc. is an engineering firm specializing in facility engineering and management. AME provides a broad spectrum of professional services inherent in the ownership and management of real estate, infrastructure, facilities, and associated equipment. AME was established in 1980 to meet an ever-expanding need for expertise in management and engineering consulting services associated with facility resources in both the public and private sectors. The firm is dedicated to supporting clients' needs through creative thinking, the application of proven engineering and management concepts, and the benefit of many years of experience with similar clients in government, private industry, colleges, universities and municipalities.